As it awaits a final budget from the state of Ohio, The University of Toledo plans to shift the adoption of its 2018 operating budget until July 6. UT leadership will ask the Board of Trustees during its regularly scheduled meeting on June 19 to adopt a one-month budget to bridge the gap between the end of the current fiscal year on June 30 and the adoption of the new budget. Following approval of the state of Ohio biennium budget before July 1, UT will present its budget for the 2017-18 to the board at a special meeting scheduled for 8 a.m. on Thursday, July 6, in the Driscoll Alumni Center Schmakel Room. During the last 18 months, the University has made strides in reducing costs and generating new income, Kelley said. UT is positioned well to adopt an operating budget that puts the institution in line to meet opportunities and challenges in the coming year. The University of Toledo Board of Trustees approved June 20 an operating budget for fiscal year 2017 that stabilizes and strengthens the University’s financial foundation. The $737.8 million operating budget is conservative with revenue based on 2016 enrollment and patient volume and reduced expenses through budget stabilization efforts taken earlier this year. The balanced budget reflects stabilization efforts called for by the president including a 1.5 percent reduction to the operating budget for fiscal year 2016 and 3 percent to the entire budget for fiscal year 2017, which reduced operating expenses by about $12 million. The cuts for 2017 already have been enacted. The 2016-17 budget includes no undergraduate tuition and general fee increases and no increase in graduate tuition, with the exception of the 2 percent increase for the third and fourth years of the Doctor of Pharmacy Program. Trustees previously approved a 2 percent increase in residence halls fees, and the budget includes a 2 percent increase in meal plan fees to cover additional costs. Professional staff will receive a 2 percent wage increase. Senior administrators will defer 2 percent increases until January contingent on positive enrollment growth. Pay increases for union salary groups are included according to collective bargaining agreements. For the clinical operations, net patient revenue is based on 2016 actual patient volume, and the budget reflects a reduction in operating expenses due to drug program savings and supply chain management pricing. “In recent years the University has experienced changes in leadership, enrollment, state support and the health-care market, and we’ve accounted for those challenges and opportunities in a way that focuses our efforts on serving students and patients and supporting UT’s quality faculty and staff,” said Lawrence Kelley, who was recently named the University’s executive vice president for finance and administration and chief financial officer after holding the position on an interim basis since November. Trustees also approved a Strategic Plan for Diversity and Inclusion. The plan is the culmination of an eight-month process led by Dr. Willie McKether that engaged students, faculty, staff and members of the external community. McKether will lead the implementation of the plan as he starts his new role as vice president for diversity and inclusion July 1. In addition, the trustees approved a collective bargaining agreement with The University of Toledo Police Patrolman’s Association that includes a 2 percent wage increase in the first and second years of the contract and a reopening of wage negotiations in year three. The 28-member union ratified the contract April 23. The board elected officers for the 2016-17 year. Sharon Speyer will continue to serve as chair, and Steven Cavanaugh will remain vice chair. The June meeting also completed the service of Dr. S. Amjad Hussain, UT professor emeritus of thoracic and cardiovascular surgery, who was named to the UT Board of Trustees in 2007. Daniel Arendt, a student trustee in the Doctor of Pharmacy Program, also was recognized for his two years of service to the board. An operating budget that positions The University of Toledo for success for the coming year and into the future was approved Monday by the UT Board of Trustees. The $737.8 million operating budget is conservatively based on flat enrollment for the coming academic year as part of the institution’s efforts to strengthen its financial foundation. Reflected in the budget are the stabilization efforts called for by UT President Sharon L. Gaber earlier in the year for a 1.5 percent reduction to the operating budget for fiscal year 2016 and 3 percent to the entire budget for fiscal year 2017, which reduced operating expenses by about $12 million. The 2016-17 budget includes no undergraduate tuition and general fees increases and no increase in graduate tuition, with the exception of a 2 percent increase for the Doctor of Pharmacy Program. Trustees previously approved a 2 percent increase in residence halls fees, and the budget includes a 2 percent increase in meal plan fees to cover increased costs. Professional staff will receive a 2 percent wage increase; however, senior administrators will defer 2 percent increases until January contingent on positive enrollment growth. Pay increases for union salary groups are included in the budget according to collective bargaining agreements. In addition, the Board of Trustees also approved the new College of Arts and Letters, which is a merger of the College of Languages, Literature and Social Sciences and the College of Communication and the Arts. The college will be led by Dr. Jamie Barlowe, who is currently the dean of the College of Languages, Literature and Social Sciences, who said the merger provides opportunities to recognize, promote and expand cross-disciplinary relationships and opportunities to benefit students. The college will include a School of Visual and Performing Arts, and Deb Davis, currently the dean of the arts college, will serve as director. The College of Arts and Letters will serve 1,900 students majoring in disciplines such as the humanities, economics, foreign languages, psychology, communication, theater and music, as well as the more than 14,500 students enrolled in general education classes taught by faculty in the college. The University of Toledo has selected interim chief financial officer Lawrence R. Kelley, an administrator with more than 30 years of experience in higher education finance and accounting roles, to fill the permanent position through 2018, pending approval by UT’s Board of Trustees. As executive vice president for finance and administration and chief financial officer, Kelley will oversee the University’s offices of Finance, Financial Planning, Analysis and Budget, Facilities and Construction, Information Technology, Human Resources and Talent Development, Public Safety, and Internal Audit and Compliance. “During the past eight months, Larry has demonstrated tremendous strategic leadership as we have worked to stabilize and strengthen UT’s financial foundation,” said UT President Sharon L. Gaber. “During that time, Larry’s leadership has helped build trust in UT’s financial processes and has created an atmosphere of mutual respect regarding financial decisions with key UT communities,” Gaber said. Kelley said he was excited by the opportunities on the horizon. “The University of Toledo has so much to be proud of, and the Division of Finance and Administration helps provide the framework and the resources that enable our students, faculty, staff and researchers to flourish,” he said. Gaber said that UT’s recent CFO search had been unsuccessful, and she asked Kelley to stay on. She said he is especially strong given his experience and expertise and the solid relationships he has established with UT’s communities. Kelley joined UT Nov. 19 and previously served as senior vice president for administration and finance and chief financial officer at California Polytechnic State University, San Luis Obispo. 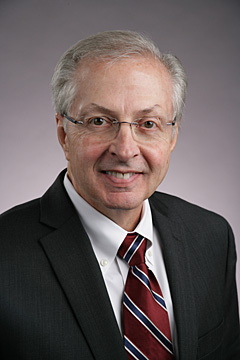 During his career in higher education administration, Kelley also has served as chief financial officer at the University of Maine, vice president for business and finance at Kent State University, associate vice president for finance and business affairs and associate treasurer at Miami University, treasurer and associate vice president at Georgia State University, and budget director at the University of Akron. The University of Toledo Board of Trustees last week approved a three-year contract with members of the American Federation of State, County and Municipal Employees (AFSCME) Ohio Council 8 and AFSCME Local 2415, which represent about 1,900 employees on Health Science Campus. AFSCME members approved the contract Sept. 4. The agreement runs from July 1, 2014, through June 30, 2017, and calls for wage increases of 2.5 percent in year one and 1 percent in both years two and three. The agreement provides employees and their dependents expedited primary care appointments at UTMC health-care facilities. It also reduces monthly health-care premiums by 2 percent as UT works to make premiums uniform across all collective bargaining units and employee groups. The new contract also establishes labor-management committees that will leverage strong partnerships to drive improvements in patient care and satisfaction, and to address unique employee occupational categories. Trustees also approved a plan by the College of Law to reduce tuition by 13 percent in response to a nationwide decline in the number of law school applicants during the last five years. Daniel Steinbock, dean of the College of Law, said UT’s bar passage rates are high, its job placement rates are strong, UT’s faculty are widely quoted in national media and cited in legal research, and the college has an active alumni base that includes prominent lawyers and judges. “The change in tuition will lower the financial threshold that can be a barrier for many to seek advanced legal education,” Steinbock said. The change represents a reduction of about $2,700 that will place UT’s in-state tuition at $17,900. The college also is emphasizing programs in addition to the juris doctor, such as the master of studies in law degree for professionals looking to increase their legal knowledge in a specific area — like health care — but don’t have positions that require admission to the bar. A presentation outlining the University’s and UT Medical Center’s responses to the Aug. 2-4 water crisis also was reviewed and included steps taken to mitigate negative affects on patients, students and employees if the situation were to happen again, and opportunities created by the advisory for UT faculty and researchers to be leaders in helping to address the algae problem. The UT Board of Trustees approved Monday the fiscal year 2015 budget that includes a modest tuition increase for students and invests in University employees. The $790.8 million budget includes tuition increases of 2.39 percent for undergraduate students and 1 percent for graduate students; however, there is no increase in the general fee. Tuition is unchanged for students in the College of Law. Undergraduate scholarships were increased for tuition assistance. The budget also includes a 2 percent salary increase for non-bargaining unit employees of the University. The combined $790.8 million budget consists of a $503.5 million budget with a 1.3 percent operating margin for the academic enterprise and a $287.3 million budget for the clinical enterprise that incudes an 8.9 percent operating margin. The budget assumes enrollment will be flat and state share of instruction dollars will increase 1.8 percent. There is a 2.39 percent increase in residence hall fees and 2 percent increase in meal plan fees. Also at Monday’s meeting, two board members were honored as their terms will expire June 30. Susan Palmer, who was appointed to the UT Board of Trustees in 2005, and Linda Mansour, who was appointed to the board in 2009, were thanked for their service to the University. The board also elected officers for the 2014-15 year. Joseph H. Zerbey IV will continue to serve as chair, and Sharon Speyer will remain vice chair. 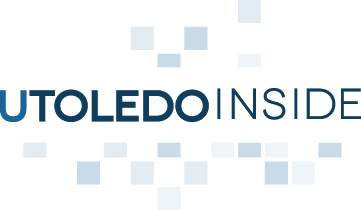 The University of Toledo budget, the implementation of the Main Campus smoking ban, and preparations for UT Medical Center’s accreditation visit by the Joint Commission will highlight the next edition of UToledo Inside Wednesday, May 28, at 11 a.m. in the Student Union South Lounge. UT President Lloyd Jacobs will host along with Larry Burns, UT vice president for external affairs. Jacobs will take questions live, via email to townhallquestions@utoledo.edu, and by way of UT’s social media platforms. The event will be webcast live at video.utoledo.edu. Dave Morlock, executive vice president for finance and administration, and CEO of UT Medical Center, will discuss the formulation of this year’s budget, what it includes, and its current status. Dr. Carl Sirio, chief operating officer for UTMC, and Marge McFadden, chief administrative officer for quality and safety, will discuss the upcoming visit by the Joint Commission. Implementation committee co-chairs Vicki Riddick and Dr. Tavis Glassman will outline the steps ahead for the Main Campus smoking ban. Also on the show will be Dr. Ronald McGinnis, interim dean of the College of Medicine and Life Sciences, who will preview the college’s upcoming commencement; Mike O’Brien, vice president and director of intercollegiate athletics, will discuss the outstanding academic scores earned by student-athletes in spring semester; and Billy Pierce, director of undergraduate admission, will talk about positive enrollment trends officials are seeing for next academic year. UT President Lloyd Jacobs has asked Jen Pastorek, director of supply chain management, to serve as interim chief financial officer and vice president of finance following the retirement of David Dabney earlier this summer. “Every year this institution spends millions of dollars on supplies and services across its campuses, and Jen’s leadership in managing this dynamic process efficiently and cost-effectively is incredibly impressive,” Jacobs said. “Jen has earned tremendous respect from the entire University community during her time at UT and is the ideal choice to provide leadership for the finance division and The University of Toledo during the transition as we finalize our search for a senior vice president of finance and administration,” he said. Jacobs added that during this interim period, no functions will move nor will any organizational chart changes occur. Pastorek, who started working at UT in 2003, said she was honored to serve as interim CFO. “I have a lot of affection for this University and the people and students who make it such a great place to work and learn,” Pastorek said. “There is a great team of people in the finance division, and we’re going to continue moving this institution forward in the days and weeks ahead. “There’s no pause button in modern higher education and health care, and I’m excited by what we can do to elevate The University of Toledo,” she said. The UT Board of Trustees last week approved a fiscal year 2014 budget that University leaders say puts students first. The $775.2 million budget includes no increases in undergraduate tuition, room and board, or general fees, which UT committed to in November very early in the budget process as part of a pledge to keep higher education affordable. 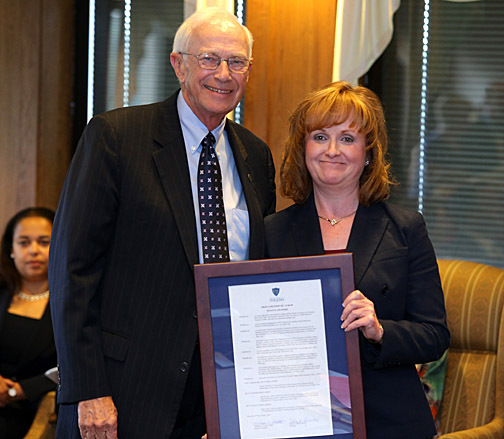 William Koester, chair of the board, presented trustee Susan Gilmore with a proclamation thanking her for her service. Her term and Koester’s expire at the end of the month. President Lloyd Jacobs presented Koester with a proclamation as well. Jacobs said UT students will benefit from more experienced professors in the classroom, given the new faculty workload requirements. At the same time, class size has been held stable with a student-to-faculty ratio of 19 to one. The only personnel cost increases are for additional academic advisers and new success coaches who assist students through their college experience. In recent years, UT has moved $12 million from backroom functions to the classroom. The 2014 budget continues such adjustments by deferring funding for some facilities and equipment upkeep so that money can be used for academic operations. The combined $775.2 million budget consists of a $498.8 million, break-even budget for academic operations and $276.4 million for the clinical enterprise that includes a 6.5 percent operating margin. Trustees also approved the adoption of remediation-free standards established by Ohio’s public college and university presidents. The standards use ACT and SAT sub-scores to determine if a student needs remediation. By the standards, students with an English score of 18 or higher on the ACT and SAT scores of 430 or higher in writing and 450 or higher in critical reading do not need remedial education in that subject. Students with a reading sub-score of 21 or higher on the ACT and 450 or higher on the SAT and mathematics sub-scores of 22 or higher on the ACT and 520 or higher on the SAT also do not need remediation in those subjects. Dr. Scott Scarborough, provost and executive vice president for academic affairs, shared with the trustees the various tools used by the University to improve the college readiness of students; these include the Aleks Learning System and the MyCompLab system. Dr. Shanda Gore, associate vice president for equity, diversity and community engagement, also gave a report on the Campus Climate Faculty and Staff Survey taken every two years to assess the climate of the University. The next survey will be in 2014. Two board members were honored as their terms on the board expire June 30. William C. Koester, who most recently served as board chair, was appointed to the UT Board of Trustees in 2004, and Susan E. Gilmore was appointed in 2004 to the Medical University of Ohio Board of Trustees. Beginning July 1, Joseph H. Zerbey IV will serve as chair, and Sharon Speyer will serve as vice chair. 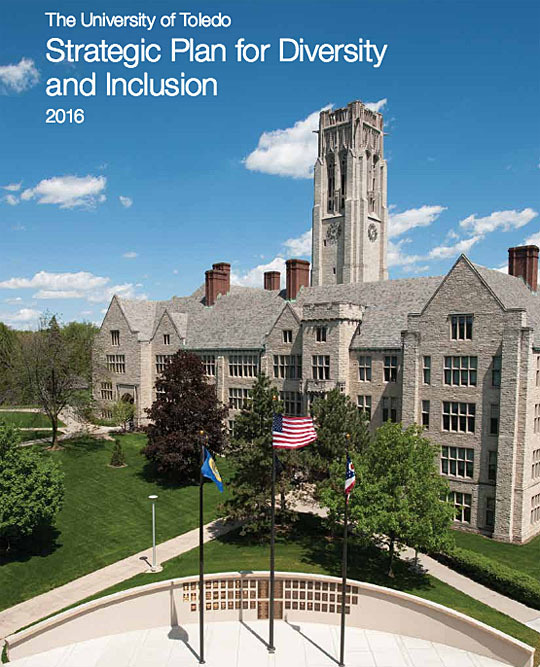 Every decision in the proposed 2014 budget for The University of Toledo was focused first on the needs and desires of students. The UT Board of Trustees will consider the president’s recommended 2014 budget that includes no increases in undergraduate tuition at its meeting Monday, June 17. The $775.2 million budget also includes no increases in room and board or general fees, something UT committed to in November very early in the budget process as part of a commitment to keep higher education affordable. The only personnel cost increases in the proposed budget are for additional academic advisers and new success coaches who will be the go-to people for students to have all of their questions answered about the college experience. The academic advisers and success coaches will work together to assist students. In recent years, UT has moved $12 million from backroom functions to the classroom, and the 2014 budget continues such adjustments by deferring funding for some facilities and equipment upkeep so that money can be used for academic operations. The University had projected a $30 million shortfall for the upcoming budget year based in part by elimination of stimulus funding and reduced state support. Deferring maintenance is one of the strategies used to address the gap. While there is some measure of risk in deferring those investments, Jacobs said the University has made an increased effort to upgrade classroom facilities in recent years and that investments in areas such as the Jesup W. Scott Honors College and the online offerings through UTXnet World Campus would help the institution recruit more, better-prepared students in the coming years. UT students also will benefit from more experienced professors in the classroom with new faculty workload requirements that adjust the hours they spend teaching along with research and service activities. The new requirements also contributed to more than $5 million in salaries and benefits savings. The recommended budget was presented June 3 to the Finance and Audit Committee of the Board of Trustees and was forwarded on to the full board for action at the June 17 meeting. The academic budget anticipates a small decline in undergraduate enrollment. Additional revenue will be generated from a recommended 3.5 percent tuition increase for graduate and professional programs. The clinical budget includes a 5 percent price increase for inpatient and outpatient procedures and projects a 4.3 percent addition in revenue based on growth in the surgery and acute rehab areas. The UT Medical Center also is transferring $2.4 million to the academic budget to support academic programs. Jacobs and Chief Financial Officer David Dabney both thanked the UT community for a highly participatory budget process that included input from the new University Council’s Finance and Strategy Subcommittee with representation from Faculty Senate, Student Government, Professional Staff Association, the deans and senior administrators. This story that appears in the June 10 print edition of UT News incorrectly used 2013 budget data. The story here has 2014 budget figures.